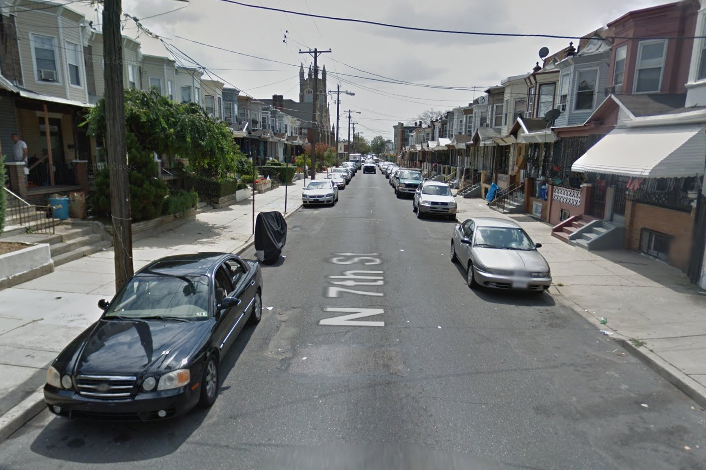 The 3700 block of North 7th Street in the Hunting Park section of Philadelphia. An investigation is underway after a father of six children was killed and his wife wounded during a home invasion in the Hunting Park section of Philadelphia, according to media reports. The incident occurred Monday around 1 a.m. on the 3700 block of North 7th Street, according to 6ABC. Authorities said two men armed with shotguns broke into the home. They went upstairs and found the 35-year-old man, the 40-year-old woman and several children in a bedroom. The suspects demanded money and opened fire. When police arrived at the scene, officers discovered the father was dead and his wife suffering from two gunshot wounds to her face and forearm, NBC10 reports. The woman was transported to Temple University Hospital where she is in critical condition. The six children, ranging in age from 5 to 13, were not injured. Investigators recovered a shotgun near the scene, but have not made any arrests.